Yes, I know it’s expensive. Like, expensive A.F. But, if you love steak, and I mean REALLY love steak, Bos Taurus is worth unloading a few Benjamins from your wallet. And it’s not just the steak—although just typing this blog is making my mouth water—it’s all the food. Take, for instance, the oysters—topped with the perfect little piece of red pepper—were delicious enough to get a non-oyster lover to eat half of my order. The popovers, which are delivered hot to the table about the time your drink comes, are so flaky and flavorful, you’ll feel transported to Paris. And speaking of a drink, the smoked Bos Manhattan comes in a glass that resembles high school science class. You leave the cork in to add to the smoky complexity, then pour when you’re ready. Back to why you should go: the steak. Bos has two kinds of A5 grade Wagyu—the Hokkaido and the Miyazaki. If you’re unfamiliar with Japanese steak ratings, A5 means the steak must be at least 25 percent marbling. In the U.S. Grade A beef need only be 6 to 8 percent marbled fat. What does this mean to the customer? The beef will almost melt in your mouth. Cows that reach the A5 rating are treated like royalty. They are often given mineral water and fed soybeans. In hot summer months, they are treated to Sake and beer. I ordered 2 ounces of both the A5 choices, which added up to about $120 in beef. More than I’ve spent in about two years on beef total. But when the first slice of Hokkaido hit my taste buds… heaven. Personally, I liked the Hokkaido better. It was like eating a bacon-meets-cow-meets-butter… if meat could be considered a dessert, this would be my suggestion. Bos has many other steak options that are excellent as well, and not $29 an ounce. The honey bruleed Cambozola cheese was melt-in-your-mouth and the white truffle pommes frites were good as well. They also have non-steak options and the compressed Caesar is well worth ordering. To indulge oneself doesn't always have to break the bank. Some of the greatest pleasures in life are reasonably priced or even cheaper than that. Here are ten things that cost between absolutely nothing and $165.00 that can either be purchased locally or from Etsy that I (somewhat) guarantee will make your life better (for at least a little while). 2- Buying DVD's from Cash Connection: Normally, Pawn shops are grim places, but Cash Connection is filled with friendly workers who are great at hiding their judgements. With thousands of DVD's to choose from (the stock of which get replenished every morning), you never know what you might walk out with. In one trip I got Master and Commander, Boogie Nights, Roadhouse and Memento. $1.75 a movie or $1.00 a piece if you buy 20 or more. 10- A Necklace of Drake looking emotional: Is he sad? Is he angry? Bad BM? The world may never know, but sometimes we do need reminding that Drake is people too and he can't always look so distant and aloof. Sometimes he needs to feel and sometimes, just sometimes, we need to see how he feels and judge him for it. $12 on Etsy. We interrupt your regularly scheduled programming with this important message: It's National Donut Day. Now, we know all these days are often marketing ploys to promote a product—in this case, deep fried dough with frosting, filling, sprinkles, and other delicious accompaniments. But we are nothing if not hungry. And on this particular day, at least one local donut shop is prepared to assist the donut-deprived masses. Sweetheart Donuts (210 SE 3rd St.) is giving out free donuts today (one per person) until 2 pm, or until they sell out. Plus, the local donut shop says the National Donut Day has its roots in a patriotic tradition (and who are we to argue with patriotism?). We invite you to join us as we help celebrate National Donut Day and honor the “Donut Lassies” who served traditional cake donuts to soldiers during World War I. Founded in 1938 in the City of Chicago, National Doughnut Day is actually a patriotic remembrance of a time when Salvation Army volunteers handed out doughnuts on the front lines to soldiers. When the soldiers came home they brought their nostalgic donut memories with them fueling the donut industry as we know it today. The donut continues to be a comfort food served by the Salvation Army to those in need during times of disaster. You don't say. We'll eat (donuts) to that! Have you heard of other shops giving a way free donuts? Let us know in the comments. It's that time of the year, when we take a look at the culinary landscape and fill you in on what's hot and who's got it, for our annual Dining Guide. But this year, in addition to naming a Restaurant of the Year and Rookie of the Year, we're introducing two new categories of recognition—Food Cart of the Year and Readers' Choice. That last one is where you come in. Using the survey box below, tell us your favorite local restaurant. The winner will be featured in our Dining Guide, online and on stands April 23. Voting closes April 8, so get to it! A community supported aquaponics business, Volcano Veggies, that got it's start back in April is finally ready for a grand opening at their indoor farm where they raise mercury-free fish & grow organic vegetables and fruit. Long hard winters in Central Oregon can make it difficult to find locally sourced product during the upcoming months, but Volcano Veggies hopes to change that. 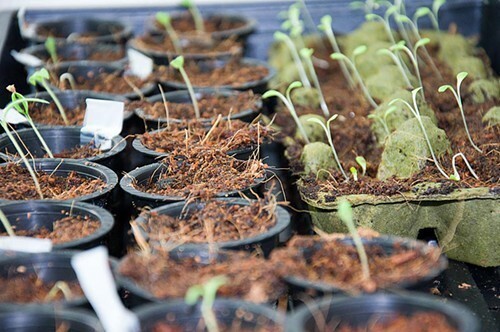 A photo from Volcano Veggies first seeds this spring. Support local agriculture (and aquaponics which they claim yields six times the amount of veggies per square foot than traditional farming) by attending the opening party and signing up for their Fresh Local Mixed Salad Greens program where Volcano will deliver a 4 oz. salad to your doorstep weekly. OPEN FOR BUSINESS! Wild Rose Thai is the newest addition to Bend's downtown dining options: A Northern-thai restaurant at 150 NW Oregon Ave., formerly Common Table. The decor inside is brightly colored and busy with beautiful terracotta flatware and brightly colored chairs and table cloths, a big change from Common Table's simplistic interior design. The low exposed beam ceilings make Wild Rose feel like the best kind of hole-in-the-wall despite the large open floor plan. Pumpkin pie, the iconic topper to a tummy full of Thanksgiving feast, and a true marker that the holiday season has arrived. In my years of attempting to create the prefect Turkey Day desert, I've learned that the keys are a handmade crust—light, flakey and especially buttery—and the perfect spice profile to balance the sweet filling. In my experience, doubling the spices recommended by most recipes will do it, a trick I learned from my grandmother—queen of deserts—who has made me my own personal pumpkin pie (with a side of hand-whipped whip cream) almost every Thanksgiving to take home after the meal. Lucky for me, this holiday season I'm working for the Source where my co-workers love pie more than your average newspaper staff. So we're hosting a Pie Off, where YOU bake and our panel of judges chooses the GREATEST PIE IN CENTRAL OREGON! The first step is to submit your recipe to us. Then, we will choose three winners who will bake off at our Media Salon at Broken Top Bottle Shop on November 11th, at 7 pm. The person who bakes the best pie will receive tickets to Jazz at the Oxford, bragging rights and the title of GREATEST PIE IN CENTRAL OREGON. Join the event of FaceBook here, and submit you recipes. Last night a few of the Source staff were invited to the amazing facility at the Cascade Culinary Institute for an evening demonstration from three of Bend's finest culinary minds. Click here for a list of ongoing Bite Week events. Steve Helt, executive chef and owner of Zydeco Kitchen and Cocktails, Juri Sbandati, executive chef and owner of Trattoria Sbandati and Matt Neltner formerly of Kokanee Cafe in Camp Sherman and current executive chef and owner of the newly opened Blue Pine Kitchen and Bar took turns demonstrating how to cook up their own delicious specialties for a small crowd of drooling onlookers. First up was gnocchi (pronounced ni-o-ki) in a tomato basil sauce from Juri Sbandati. The rustic Italian pasta-like cheesy potato bites were light and tasty smothered in red sauce that Sbandati cooked up in the biggest frying pan I have ever seen. He explained the pan is straight from the kitchens in Italy. The Pour House Grill, a new pub-style eatery, has taken over the former Versante Pizza location at SE 3rd St. Opened June 1st the joint serves burgers, chicken wings and ribs. Click here for their full menu. Used to be: Versante, before that, Zydeco. The bar boasts 20+ taps, a requirement for any successful eatery in Bend. Meanwhile, Versante has taken over half of the Westside Bakery space on Galveston. Spork: Now Open on Newport Ave.
Good news—more delicious food now available on Bend's westside. After a soft opening on Saturday (following a friends-of-the-restaurant party on Friday), Spork, the godfather of Bend's food cart scene, is now open full time inside a permanent location on Newport Avenue (in what was Fox's, the short-lived pool hall). We ate there on Saturday and Erica Reilly's latest venture was as exceptional as we had hoped. Nothing on the menu was over $10 and old favorites (Spicy Fried Chicken!) stood alongside new ones (Hoisin Pork Belly Sando; Spanish Tortilla). There's a deep list of small bites (fried yucca chips!) and plenty of gluten-free options, if you're into that. Spork is taking a sensible angle in regard to beverages, too. Six taps—thank God they preserved precious kitchen space for actual cooking rather than succumbing to the Central Oregon mentality that demands all eateries must have 20+ taps of the same beer—and a robust mixed-drink menu of classic cocktails and in-house infusions. Sit, drink and snack—they're open from 11am-10pm and later—like 'til midnight—on Friday and weekends. Not being a huge coffee connoisseur, the barista explained to me that cold brew isn't just an iced coffee. It's a specialty brewing method using cold water to reduce acidity and harsh flavors that permeate when ice is added to coffee brewed with hot water. It's delicious and smooth and gaining in popularity in Bend. It's Friday and the weather is uhh-may-zing. Good reasons to go out tonight. But here's the best one—there's a pretty solid rumor going around that Brickhouse will open tonight in the old Firehall. Though we couldn't confirm in person, the restaurant's voicemail message says it's happening. New lounge menu plus the best steaks in town according to Bend Source readers. 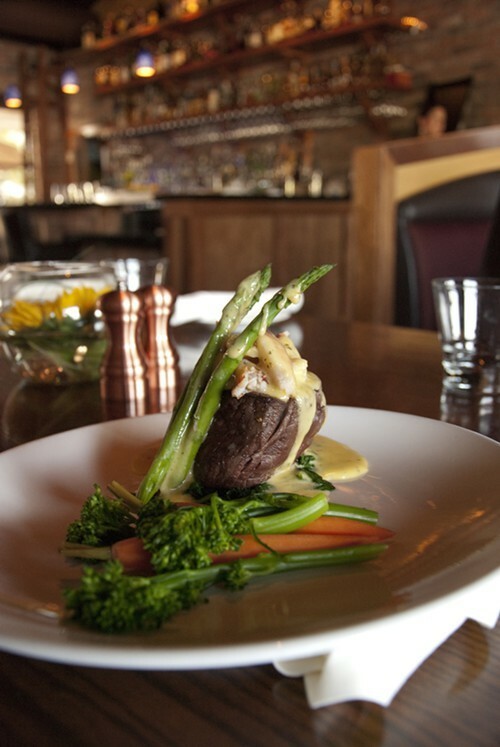 Oscar filet at Brickhouse, now located downtown at the old Firehall, 5 NW Minnesota Ave.
Have you had an Oscar filet with Dungeness crab at Brickhouse, because it's it's a singular experience in Bend. Wait, that's right, Caldera Grille does have that benedict with the Dungeness crab and the beef medallions, but we're pretty sure it's just not quite the same. This change likely means that the former location of the Bend Brickhouse, at 803 SW Industrial Way will no longer be open. Stay tuned for future issues of the Source for all the details. If you want to avoid what will likely be a scene at Brickhouse, we recommend trotting just a block up Lava Road to The Jackelope Grill. The outdoor courtyard there opens for the season tonight and it's another lovely spot to spend a warm spring evening.